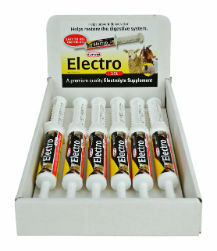 An oral electrolyte supplement to help prevent dehydration and restore the digestive system in sheep, goats and pigs. Orally administer 1/2cc to 1cc per pound of body weight by mouth twice daily or more often as needed. Provide adequate water after each feeding. Maltodextrin 8.55g, L-Glutamine 1.74g, Sodium Chloride, Sodium Bicarbonate,Potassium Chloride, Xantham.